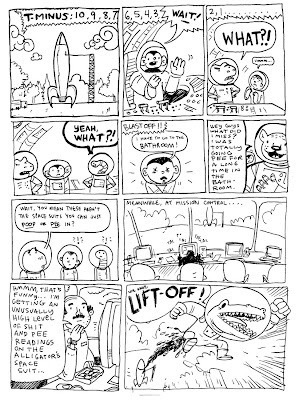 Joe Quinones' interweb-log: HEROES CON 2008! Went by really fast (as I missed the first day of the con), but was a lot of fun! Paolo and I were tablemates and got to sit next to none other than Darwyn Cooke! Somehow though, we did not get the chance to meet him. He was insanely busy the entire time. I did meet his wife though - as she fought to keep her husband unharmed by the massing hordes of fanboys. She was very nice. While Maris and I waited in the airport to catch our flight back home, we found ourselves in the good company of comics artist Brian Ralph. Together we passed the time by doing some exquisite comics and a jam drawing. There were a couple of commissions I did over the weekend as well, but they're stuck on Paolo's camera. I'll upload 'em once he sends them my way.